Alongside these interest societies there are societies that are related to specific degree subjects for example Biology, Geography, and History. All of these societies are available to all students and can greatly benefit your time at university. For my course there is a linked Psychology Society which is run by students for the students. They run talks every few weeks with both internal and external speakers giving a practical insight into the world of applied psychology. I went to one of these talks recently with two internal lectures, Dr Helen Scott and Dr Derek Farrell, talking about their past professional experience and how they got there. Firstly Dr Helen Scott discussed how you shouldn’t worry if you don’t know exactly what you want to do career wise as she originally started studying Clinical Psychology whilst working as a rehab assistant at a private hospital with patients with brain injury. She discussed how this improved her resilience and taught her how to find the positive out of any situation. It was then explained how she worked to apply positive changes to the workplace and this followed on with a career change to Occupational Psychology whilst working in HR at Boots which led on to a Masters in Occupational Psychology. It really highlighted how the career path you originally choose may not end up being the one you go down. Following this Dr Derek Farrell explained his background originating in mental health working with 2500 patients at a high dependency acute psychiatric ward. He went on to discuss the people and places that inspired him and developed his passion in traumatology (the study of the impact of acute trauma) and his contribution to the development of EMDR training (a method to reduce the impact of trauma). He is currently working with the University of Worcester to implement a Masters course in EMDR training to further continue the valued work it carries out. He discussed how his job took him travelling all around the world from Liverpool, Northern Island (where he worked with mental health patients towards the Good Friday agreement), and New York, to Pakistan and Burma (Myanmar) where he works following the 2005 earthquake and implemental a humanitarian program to help mental health patients. 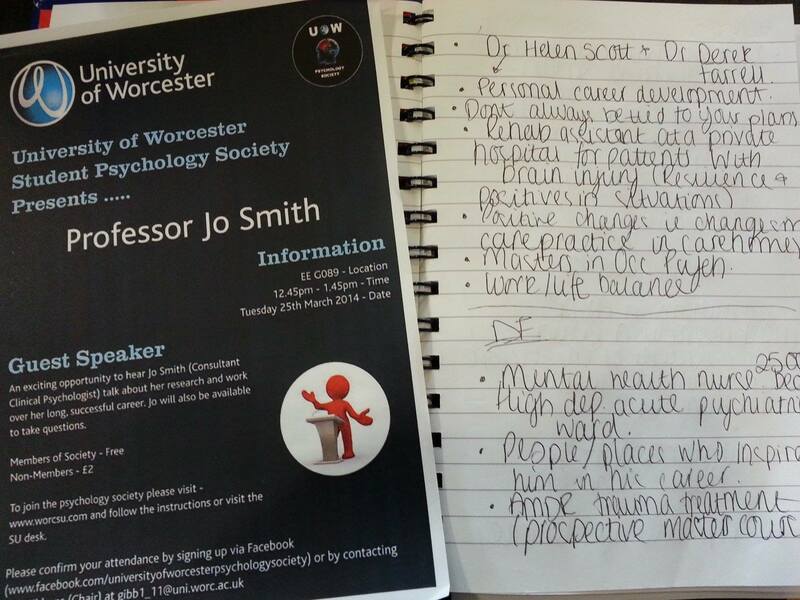 The talk was inspiring and highlighted the varied pathways that you can take once you do a psychology degree. I’m looking forward to going to other talks run by the society (the next one is by Professor Jo Smith, a consultant clinical psychologist, who discusses her research and work). If you wish to join the society or see what up and coming talks and events are happening you can find them on their Facebook page and Twitter feed.